Harry Potter star and UN Women Goodwill Ambassador Emma Watson has been cast as Princess Belle in Disney’s live-action remake of their animated classic. 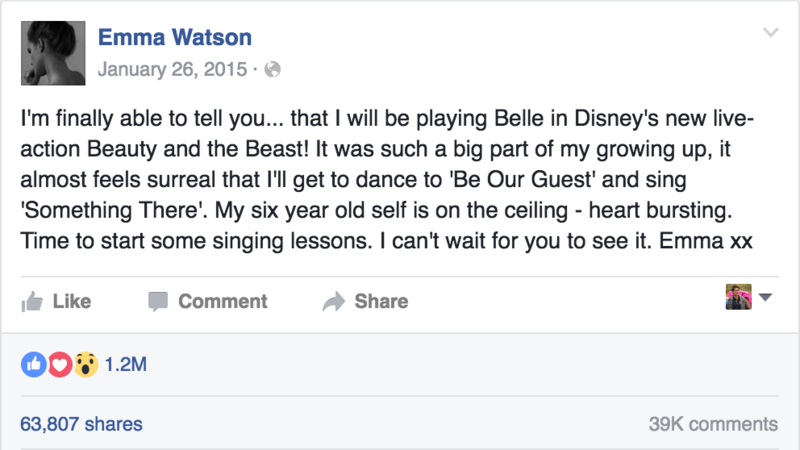 Disney announced the casting news in a statement earlier this week, with Watson then taking to Facebook to comment on the news herself. From her comment, it looks as if this will be a musical production making it the only live-action remake that Disney will do to incorporate the music from the original film, although Disney hasn’t confirmed that yet. Production is planned to start later this year with Bill Condon (Twilight film series). The “Beauty and the Beast” remake will continue Disney’s line of live-action remakes of its animated films that include the upcoming “Cinderella” and “The Jungle Book” and past titles like “Maleficent” and “Alice In Wonderland”. UPDATE 3/5/15: Actor Dan Stevens has been cast as Beast and actor Luke Evans has been cast as Gaston.